A disk with radius r = 0.10 m is oriented with its normal unit vector n at an angle of 30o to a uniform electric field E with magnitude 2.0*103 N/C. (a) What is the electric flux through the disk? (b) What is the flux through the disk if it is turned so that its normal is perpendicular to E? (c) What is the flux through the disk if its normal is parallel to E? The flux is given by Φ = ∫E∙dA. 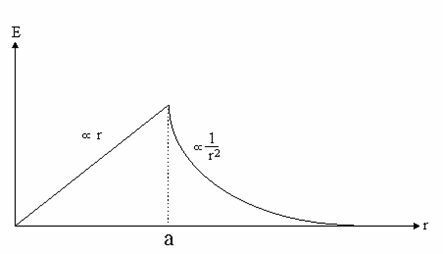 (a) Since the field is constant, Φ = EAcosθ, where θ is the angle between the field and the normal, and A = πr2 = π(0.1)2 = 0.0314 m. Then for θ = 30o we obtain Φ = 54.4 Nm2/C. (b) Now θ = 90o thus Φ = 0 Nm2/C. (c) Now θ = 0o thus Φ = 63 N m2/C. Inside a sphere of radius R and uniformly charged with the volume charge density ρ, there is a neutral spherical cavity of radius R1 with its center a distance a from the center of the charged sphere. If (R1 + a) < R, find the electric field inside the cavity. We can view the sphere with the cavity as a superposition of a sphere with radius R having a uniform charge density ρ and another sphere with radius R1 located in the cavity space having a uniform charge density -ρ. The field due to each of these spherical charge distributions can be found from Gauss' law. Let the center of the large sphere be located at the origin. E = E1 + E2. E1 = ρr/3ε0 for r < R.
E2 = -ρ(r-a)/3ε0 inside the cavity. The field inside the cavity is constant and points into the direction of the vector a. The electrostatic potential V is 0 on a spherical shell of radius r1 = 0.10 m and V is 100 Volts for a concentric shell of radius r2 = 2.00 m. Assume free space between these concentric shells, and find E between the shells. The problem has enough symmetry to find E(r) from Gauss' law alone. From Gauss' law: E(r ) ∝ 1/r2 between the spheres. The direction of E is radially inward. E(r) = -A/r2, wit A positive. A(1/(0.1 m) - 1/(2m)) = 100 V.
E = -10.526 V/m (r/r). A charge distribution produces an electric field E = A(1 - exp(-βr))(r/r3) where A and β are constants. Find the net charge within the radius r = 1/β. A radial field is produced by a spherically symmetric charge distribution. E(r)4πr2 = Qinside/ε0 in SI units. For r = 1/β we have A(1 - e-1)4π = Qinside/ε0. Qinside = A(1 - e-1)4πε0. Determine the charge distribution that will give rise to the potential V(r) = kq exp(-mr)/r, with m a positive constants. Calculate the total charge in the distribution. V(r) = V(r). ∇2V(r) = -ρ/ε0, except at r = 0, where the expression for ∇2V(r) = is not defined. To find the charge at the origin we use Gauss' law. except at r = 0, where the above expression for ∇2V(r) = is not defined. E = -∇V(r) = (∂V(r)/∂r)(r/r). Er(r) = (kq/r2)exp(-mr) + kq m exp(-mr)/r. For a spherical surface of radius r we have 4πr2E(r) = Qinside/ε0. As r --> 0, Qinside/ε0 = 4π kq. ρ(r) = 4πε0 kqδ(r) - ε0m2 kq exp(-mr)/r. With k = 1/(4πε0 ) we have ρ(r) = qδ(r) - (m2/4π)q exp(-mr)/r. = q - m2q/m2 = 0. (a) Consider a non-conducting sphere with radius a. This sphere carries a net charge Q, assumed to be uniformly distributed. Find the electric field inside and outside the sphere. Sketch the result. (b) Now consider a conducting sphere with radius a carrying a net charge Q. Find the electric field inside and outside the sphere. The charge distribution has spherical symmetry and E can be found from Gauss' law alone. (a) Place the center of the sphere at the origin of the coordinate system. Consider a spherical Gaussian surface of radius r centered at the center of the spherical charge distribution. i. Let r be greater than a, so that the surface encloses the entire charge distribution. E = Q/(4πε0r2) n, where n = r/r. The field outside the sphere looks like the field of a point charge Q.
E = ρr/(3ε0) n = Qr/(4πε0a3) n.
The field inside the sphere increases linearly with r.
(b) The charge is uniformly distributed over the surface of the conductor. r >a: E = Q/(4πε0r2) n, r < a: E = 0, the electric field inside a conductor is zero in electrostatics. The problem has spherical symmetry. Inside a conductor ρ and E are zero. (a) ρ = 0 in a conductor, and since E = 0, the total charge enclosed by a Gaussian surface in a conductor is zero, so the surface charge at r = R cancels that of the charged sphere. The surface charge is uniformly distributed on the inner surface of the conductor. E(r)4πr2 = -4πKrn+3/((n + 3)ε0), E(r) = -Krn+1/((n + 3)ε0), for r < R.
Again E = 0 for r > R, inside the conductor. Φ = - K(rn+2 - Rn+2)/((n + 2)(n + 3)ε0) for r < 0, Φ = 0 for r > 0. Consider two conductors carrying free charges +Q and -Q respectively. Consider a closed surface S surrounding the conductor carrying charge Q. The only excess charges inside S reside on the conductor. Using j = σE we have Q/I = RQ/V = RC = ε0/σ. C = Q/V = 2πε0a. Therefore R = 1/(σ2πa) = ρ/(2πa). A charge Q is uniformly distributed through the volume of a sphere of radius R. Calculate the electrostatic energy stored in the resulting electric field. From Gauss' law we have E(r) = Q/(4πε0r2) for r > R, and E(r) = ρr/(3ε0) for r < R.
Here ρ = 3Q/4πR3. Therefore E(r) = Qr/(4πR3ε0) for r < a. At r = 0 we have E(r) = 0. The total electrostatic energy of the sphere may be calculated from the electric field, using U = (ε0/2) ∫all space E·E dV. (SI units). = (Q2/(8πε0))[∫0Rr4dr/R6 + ∫R∞dr /r2] = [Q2/(8πε0)][1/(5R) + 1/R] = (3/5)Q2/(4πε0R). A model of the hydrogen atom was proposed before the advent of quantum mechanics, which consists of a single electron of mass m and an immobile uniform spherical distribution of positive charge with radius R. Assume that the positive charge interacts with the electron via the usual Coulomb interaction but otherwise does not offer any resistance to the motion of the electron. (a) Explain why the electron's equilibrium position is at the center of the positive charge. (b) Show that the electron will undergo simple harmonic motion if it is displaced a distance d < R away from the center of the positive charge. Calculate its frequency of oscillation. (c) How big would the atom need to be in order to emit red light with a frequency of 4.57*1014 Hz? Compare your answer with the radius of the hydrogen atom. (d) If the electron is displaced a distance d > R from the center, will it oscillate in position? Will it undergo simple harmonic motion? Explain! The field due to a spherically symmetric charge distribution can be found from Gauss' law. The charge distribution is spherically symmetric and so the electric field is E(r) = E(r) r/r. Let the center of the positive charge be the origin and consider a Gaussian surface defined to be a sphere or radius r at the same origin. The total flux is Φ = ∫E·dA = 4πr2E(r) = Qinside/ε0. If 0 < r < R, then Qinside = 4πρr3/3, with ρ = 3qe/4πr3. In this region E(r) = ρr/(3ε0). If r > R, the electric field is the same as expected for a point charge, E(r) = qe/4π ε0r2. We can now easily answer the questions. (a) The force acting on the electron is F(r) = -qeρr/(3ε0), pointing towards the origin. Therefore the only point where the sum of all forces is zero is the origin. (b) The force is a restoring force and is proportional to the displacement of the electron from r = 0. The resulting motion will be simple harmonic motion. The "spring constant" associated with this motion is k = qeρ/(3ε0) = qe2/(4πε0R3). f = (2π)-1(k/m)1/2 = (2π)-1(qe2/(4πε0mR3))1/2. (c) R = [qe2/(16π3ε0mf2)]1/3. For f = 4.57*1014 Hz we need R = 3.13*10-10 m.
(d) For d > R the force is still restoring. Therefore the electron will undergo oscillatory motion. The magnitude of the force is proportional to 1/r2, however, and therefore the motion will not be simple harmonic motion. ρ = 0, r > a. (a) Calculate the total charge Q. (b) Find the electric field and potential for r > a. (c) Find the electric field and potential for r < a. (d) Find the electrostatic energy of this charge distribution. (a) Q = 4πρ0∫0a r2dr(1 - r/a) = 4πρ0[(a3/3) - (a3/4)] = 4πρ0a3/12. (b) E = (1/(4πε0))Q/r2, radially outward for positive ρ0. Φ = (1/(4πε0))Q/r = (1/ε0)ρ0a3/(12r). (c) E = (1/(4πε0)) Qinside/r2, radially outward for positive ρ0. Qinside = Q = 4πρ0∫0r r'2dr'(1 -r'/a) = 4πρ0[(r3/3) - (r4/(4a))]. = (ρ0/ε0)[a2/6 - r2/6 + r3/(12a)]. A 500 m length of high-voltage cable is undergoing electrical testing. The cable consists of two coaxial conductors, the inner of 5 mm diameter and the outer of 9 mm internal diameter. The space between the conductors is filled with polythene which has a relative permittivity of 2 and which can withstand electric field strength of 60 MVm-1. (a) Find the maximum voltage which can be applied between the conductors and the energy stored in the cable at this voltage. (b) If the cable is to be discharged to a safe level of 50 V in 1 minute, what value of resistance must be connected across it? What is the maximum power and the total energy dissipated in the resistance? The problem has enough symmetry to find D(r) and E(r) from Gauss' law alone. (a) From Gauss' law: D(r), E(r ) ∝ 1/r between the cylinders. Let the outer cylinder be grounded and V0 be positive. Then the direction of E is radially outward. with a = 5 mm and b = 9 mm. V0 = (6*107 V/m)*(2.5*10-3 m)*ln(9/5) = 8.82*104 V is the maximum voltage which can be applied. W = (ε/2)∫E2dV = (εL/2)2π∫a/2b/2E2rdr = επL∫a/2b/2(V0/(rln(b/a)))2rdr. W = [επLV02/ln(b/a)] = [2πε0(500 m)*(8.82*104 V)2/ln(9/5)] = 368 J.
where r is the distance to the center, and ρ0 and a are constants. (a) What is the electric field inside and outside the cylinder? (b) Setting V(r=0) = 0, find the potential at all points r < R.
(c) What are the equilibrium positions of a particle with charge q placed inside the cylinder, assuming the charge does not alter ρ(r). What is the force acting on the particle if it is displaced by a distance ε << a from an equilibrium position. Are the equilibrium positions stable? Choose cylindrical coordinates. Then E will only have a radial component, E = E(r) (r/r). (a) For a volume of unit length: 2πrE = Qinside/ε0. For r < R: 2πrE = (ρ0/ε0)2π∫0rr'dr'(1 + (r'/a)2)-2.
ε0rE/ρ0 = (a2/2)(1 - 1/(1 + (r/a)2)) = (r2/2) /(1 + (r/a)2). For r < R: E(r) = ρ0r/(2ε0(1 + (r/a)2)), E(R) = ρ0R/(2ε0(1 + (R/a)2)). For r >R: 2πrE = (ρ0/ε0)2π∫0Rr'dr'(1 + (r'/a)2)-2. For r >R: E(r) = (ρ0R2/r)((2ε0(1 + (R/a)2)), E = constant/r. (b) V(r < R) = -∫0rE(r')dr' = -(ρ0/(2ε0))∫0rr'dr'/(1 + (r'/a)2) = -(ρ0a2/(2ε0))∫0r/axdx/(1 + x2). V(r < R) = -[ρ0a2/(4ε0)] ln((r/a)2 + 1). (c) All positions on the cylinder axis are equilibrium positions. With respect to displacements along the cylinder axis these positions are neutral. The force on the particle is zero. With respect to small displacements ε from equilibrium perpendicular to the axis of the cylinder the force is F = qE(r) ≈ qE(0) + q(dE/dr)|0ε = q(dE/dr)|0ε = qρ0ε/(2ε0) (r/r). This is a linear restoring force if q and ρ0 have opposite signs. If q and ρ0 have opposite signs, then the equilibrium points are stable. If q and ρ0 have the same sign, then the equilibrium points are unstable. Consider an infinite plane with a uniform charge density σ located at z = 0. (a) Using Gauss' law, find the electric field created by this plane. (b) Find the potential Φ(z). (c) Locate another plane with charge density -σ at z = d. Find the potential Φ(z) everywhere. What is the magnitude of the potential jump across the dipolar layer configurations of the two planes? (d) Find the force per unit area between the planes. We use Gauss' law to find the magnitude of the field produced by the plane. (a) The electric field is perpendicular to the plane by symmetry. The field E produced by the sheet is E = k σ/(2ε0) for z > 0 and E = -k σ/(2ε0) for z < 0. (b) E = -k ∂Φ/ ∂z. Let Φ = 0 at z = 0. Then Φ = -σ|z|/(2ε0) for all z. (c) The potential due to the second plate is Φ = σ|z - d|/(2ε0) - σd/(2ε0). Using the principle of superposition we have Φtotal = σ|z|/(2ε0) + σ|z - d|/(2ε0) + constant. If we want to keep Φ = 0 at z = 0, then the constant equals σd/(2ε0). For 0 < z < d: Φtotal = -σz/(2ε0) - σz|/(2ε0) + σd/(2ε0) - σd/(2ε0) = - σz/ε0. For z > d: Φtotal = -σz/(2ε0) + σz|/(2ε0) - σd/(2ε0) - σd/(2ε0) = - σd/ε0. The magnitude of the potential jump across the dipolar layer is σd/ε0. (d) For the two planes: E = -k σ/ε0 between the planes, E = 0 everywhere else. U = (ε0/2)E2 Ad = σ2/(2ε0) Ad, |F| = |dU/d(d)| = σ2/(2ε0) A, F/A = σ2/(2ε0). A charge Q is placed a distance D from an infinite slab of non-conducting material with charge density ρ and thickness d. What is the force on the charge? The problem has enough symmetry to find the electric field from Gauss' law alone. Outside the slab: Eoutside = n ρd/(2ε0), where n is a unit vector perpendicular to the closest surface and pointing away from the surface. FQ = n Qρd/(2ε0).